Mui Ne is tiny little town in the south of Vietnam and is easily accessible from Ho Chi Minh City. We took a sleeper bus from HCMC that left at 7pm and dropped us off at our accommodation in Mui Ne around 1am. Super convenient! From Mui Ne you can take buses onwards towards Da Lat or Nha Trang or back towards HCMC. Mui Ne is super popular with both Russian and Korean tourists. Most places have Russian signs and menus and we stayed with a Russian family for our three nights in Mui Ne! It’s easy to see why they love it. 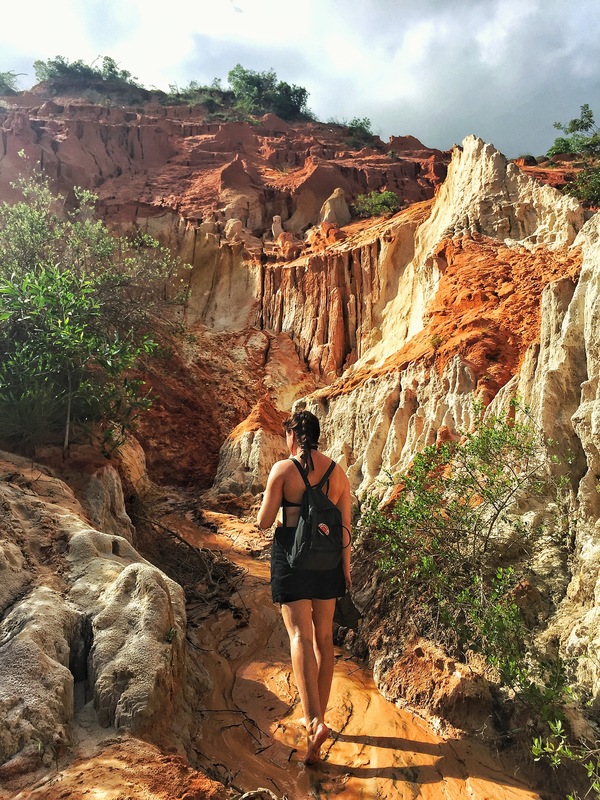 Mui Ne is small, easy to get about, has a great selection of restaurants, some great beachfront hotels and daily tours to the nearby sandunes and fairy stream. But don’t expect luxury! Unlike nearby Nha Trang, which is a fully fledged, shiny tourist resort that wouldn’t look out of place on the Spanish coast, Mui Ne is a little rough around the edges. Think beaches with lots of crabs and jellyfish left behind by the fishermen, coffee which isn’t quite there yet and roads that flood every time it rains. 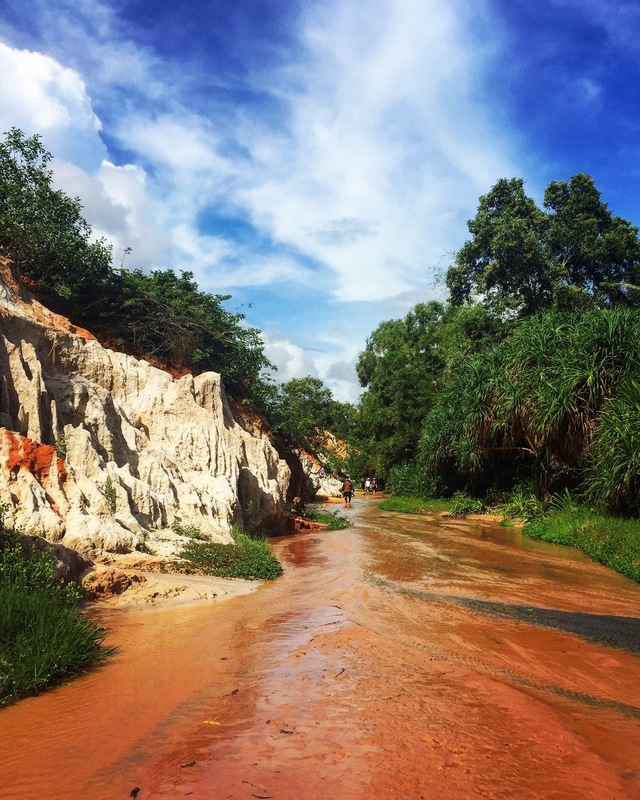 The highlight of Mui Ne has to be the Fairy Stream. The Stream leads visitors from the sea about 1km inland to a waterfall. The waters are rich burnt orange from the nearby sands and the edges are surrounded by luscious greenery. Yes, you just walk through the stream! Like everywhere in Vietnam, the locals know a tourist trap when they see one and there are a few sellers at the side of the stream selling drinks and coconuts. We spent a day exploring the Fairy Stream ourselves but also took a tour the following day which additionally showed us the fishing village and the white sand dunes. We had hoped to also see the red sand dunes for sunset but a lot of monsoon rain put a stop to that plan! 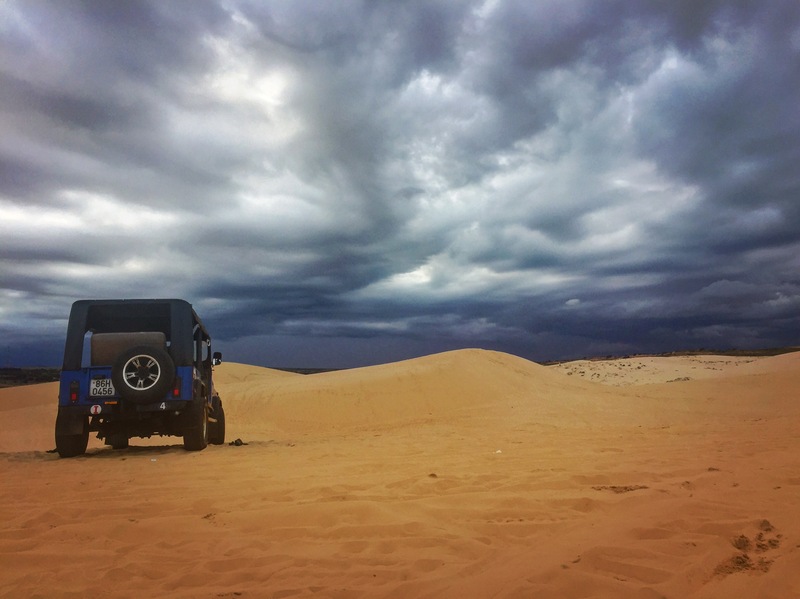 Most tours run by jeep which is pretty cool (but also very wet when it rains!) and the one we took from Sinh Tourist cost 139VND or about £4.50. 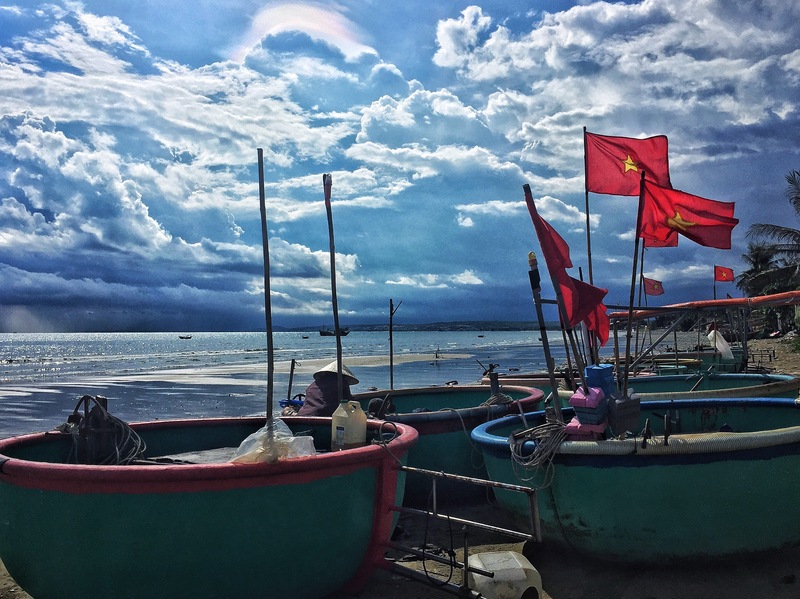 The fishing village is just a part of shore occupied by the little round fishing boats that the Vietnamese use and a lot of boats out at sea. A nice place to take a photograph but not a lot to do. From the fishing village we drove to the white sand dunes which is about 30 minutes drive. Upon arriving, the sky went very dark and we only just missed the rain! At the sand dunes most people take a quad bike across the dunes to the highest point but as Conor had just told me a story of a friend of a friend who died doing this we walked… it’s a strenuous walk, especially in the heat! The sand dunes are great but as I live so close to sand dunes in England I wasn’t particularly blown away by them. Sand dunes are just sand dunes! The stormy sky did make for a great dramatic picture though. After this the heavens opened and we took a very rainy jeep ride back to our accommodation. Our accommodation was great, a bargain £10/night for a private room for two and had a huge well equipped gym but I think I would have preferred to stay in a beach front hotel. Most of the beach is lined with hotels which have pools and loungers overlooking the ocean, definitely a great place to relax! Finally, one of my favourite parts about Mui Ne, the food. We ate two nights in a row at the same restaraunt because it was so good and it wasn’t even Vietnamese style. On the main street through Mui Ne is a Greek kebab restaraunt called Sindbad and oh my goodness, it is delicious! 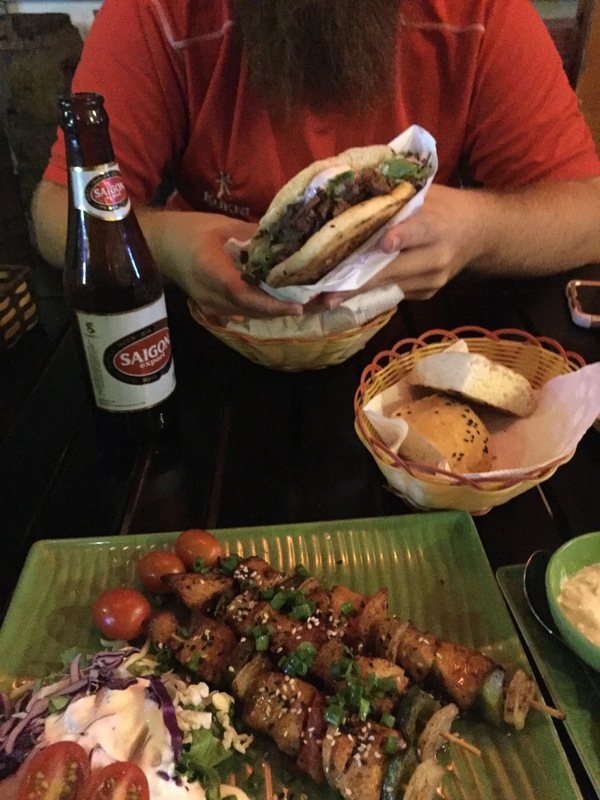 Lots of different kebabs, hummus (yes, hummus… in SE Asia, I know! ), tzatiki and amazing feta cheese. Naturally, 40p beer is available too. There isn’t loads of things to do in Mui Ne. The Fairy Stream and sand dune tours are typically half a day and that gives you an idea of how long you need to spend here. However if you fancy pottering about, hitting the gym (Papaya gym has an abundance of equipment and you can pay to use it if you aren’t a guest) or lazing by a beach front pool it’s a great place to while away a few days. From HCMC and Mui Ne you can easily get to Nha Trang. From what I’ve read online, Nha Trang can get a bad reputation and so we only spent one night there. Nha Trang actually has some great, cheap hotels and some cool beach front bars (with pools!) and sun loungers with a beach far cleaner than Mui Ne. Equally, there are thousands of great restaraunts and shopping options here. You will get hassled by sellers (as with a lot of places in Vietnam) but the plus side is, if you’re western they’ll automatically speak to you in Russian and you can ignore them guilt free! In my opinion, both Mui Ne and Nha Trang are definitely worth a visit. But I am a little biased as I love most places by the sea! There’s just something about the sea breeze and the crashing of the waves that makes me feel instantly relaxed. Where’s your favourite place to spend a few days relaxing? To read more of our adventures click subscribe below and you’ll never miss an update!